2. Choose “Services” on the left and then press “VPN”. 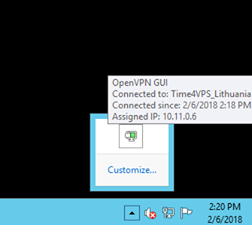 Select openvpn-install-2.4.4-I601.exe installer for Windows Vista and later. 3. Download OpenVPN configuration file from the client system. Click on “Download” button and choose the configuration file for Windows, then select “Save” in the download dialog. Click “Open Folder” when the download is complete. 4. Now after the OpenVPN GUI is installed you need to paste your unique configuration file to the OpenVPN GUI config folder. Copy the downloaded config file. Now go to your disc “C:”, then to “Program Files” folder, then to “OpenVPN” folder and to “config” folder at last. 5. Now go to the Desktop. Before running OpenVPN GUI you need to modify the application options, if you don’t do this you will either get “Error creating HKLM\SOFTWARE\OpenVPN-GUI key.” error message or application will launch and connect, but IP address will not change (because there wouldn’t be any permissions to modify the routing table to send all traffic via VPN tunnel). To do that right click on OpenVPN GUI icon, select “Properties”. 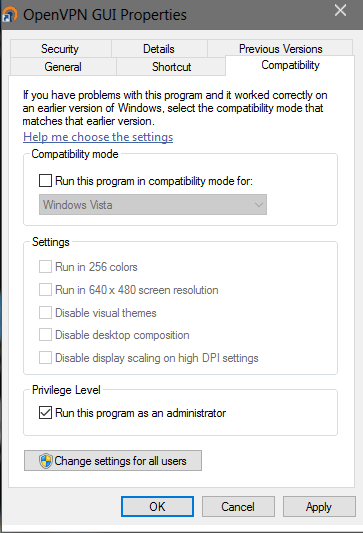 Go to “Compatibility” tab, check “Run this program as an administrator” box, click “OK” button. Double click on the OpenVPN GUI icon on the desktop. This will launch the application and create a little icon in a shape of the computer screen and the lock on your taskbar. 6. Right-click on the icon and select “Connect” and fill in login credentials that you can find on the client system. 7. 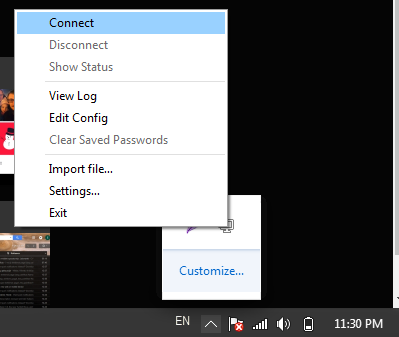 The program will show the connection window with a log and the icon on the taskbar will become yellow. When the VPN is connected, log window will disappear and the icon will be green.